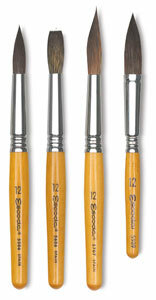 These are perhaps the finest brushes available for working on ceramics, porcelain, and glass. Each brush is hand crafted in Spain, using the finest select hair and materials. Soft squirrel hair applies smoothly and hides brush strokes. Its hair is longer and comes to a slanting tip, perfect for curves and detailing. Short handle ranges from 55 mm to 85 mm in length.